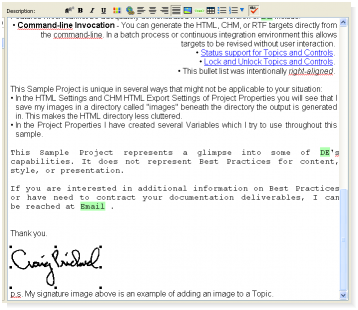 Dr.Explain help authoring tool provides an effective way to edit your help file pages. Built-in spell checker will help you to keep your text free of typos and errors. Spell checker highlights the misspellings and suggests replacements if you right-click on them. Dr.Explain's spell checker has a set of pluggable dictionaries for the most popular national languages. Dr.Explain is a unique tool for creating help files for localized versions of your software systems.